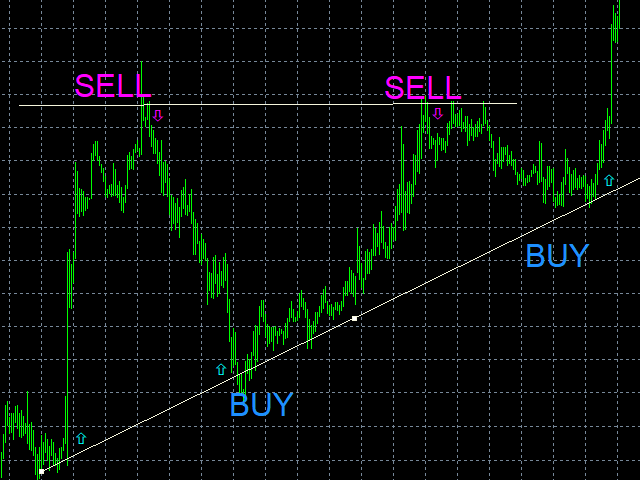 Automatic system for trading your support and resistance levels, as well as trend lines. Draw a horizontal level line or a trend line on the chart. Once the price touches the support line (above), a buy order is opened. Once the price touches the resistance line (below), a sell order is opened. The system has all the settings for maintaining and closing orders. Averaging function can be enabled, if necessary. Fully customizable Expert Advisor for your strategy. Lines Type - Limit, trades rebounds from a line. Stop opens orders in the movement direction. LinesDeleteAfrerOpenOrder - if false, when the price touches the line, an order is opened and the line is removed from the chart. OrderMagicNumber - for the robot to manage orders opened in its window only, the magic number must be unique. OrderMaxCountByLine - the number of orders allowed to be opened on each line. OrdersLots - change the lot size. OrdersTP - take profit value. OrdersSL - stop loss vale. OrdersAveraging - enable/disable money management. OrdersAveragingStepPips - distance to open the next order. OrdersAveragingMaxCount - the number of orders. OrdersAveragingCloseByTotalProfit - close orders when the specified profit is reached. For testing, run any instrument in the strategy tester, draw the horizontal lines and trend lines on the chart. If you do not know how to plot support and resistance lines properly, you are recommended to use a corresponding indicator and overlay the lines.